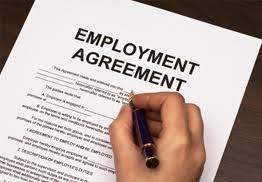 Home » Businesses and Startups , Contract of Employment , Labour Act » Dunmade Onibokun - Do you have a Contract of Employment? Dunmade Onibokun - Do you have a Contract of Employment? There are a lot of people reading this post, answering “No” to the above question. Next is thinking asking why you don’t have one in the first place and wondering if you are even entitled to one? Personally, I have met workers who informed me that though they were engaged in various forms of employments, they did not have written Contracts of Employment neither had they been provided one by their employers. (h) any special conditions of the contract. Furthermore, Subsection (2) states that if after the date to which the said statement relates there is a change in the terms to be included or referred to in the statement the employer shall, not more than one month after the change, inform the worker of the nature of the change by a written statement; if he does not leave a copy of the statement with the worker, shall preserve the statement and ensure that the worker has reasonable opportunities of reading it in the course of his employment, or that it is made reasonably accessible to the worker in some other way. From the above, it’s essential that workers are provided with copies of their Contracts of employment according to the provisions of the law. By virtue of Section 21 of the Act, any employer who breaches the above mentioned law is guilty of an offence and liable to payment of a fine.